What Does the Wooly Worm Predict? The wooly bear or wooly worm is the larval stage of the Isabella Tiger Moth (Isia isabella or Pyrrhactia isabella). In their life cycle, the moth lays hundreds of eggs on leaves of the broad leaf plantain. Most lawns have this weed. When the eggs hatch, the small worms feed upon the leaf. The worms mature in the summer. What we see in the fall is the mature worm continually crawling until it finds a place where it can curl into a round ball in or under logs, leaves and stone piles to spend the winter months. In the spring it comes out of its winter home, crawls on to logs, small trees, and bushes where it begins to spin a silk sack around itself. After about a week in this sack, the worm is transformed into a winged insect to begin its cycle all over again. 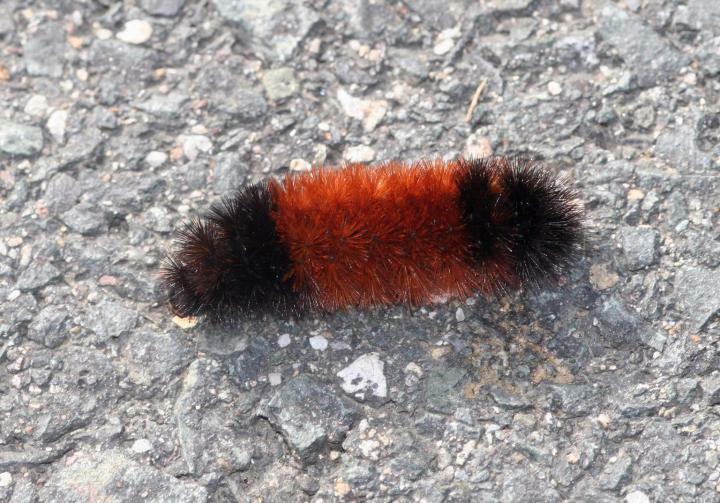 The woolly worms of winter weather forecasting fame are black at each end with a reddish-brown band in the middle. The size of the brown band, the harsher the winter. If woolly worms are more brown than black and the middle band tends toward orange, that indicates the winter will be mild. There are actually other ways to interpret the wooly worm. There is a Wooly Worm Festival at Banner Elk, NC. They use a formula that says; The wooly bear caterpillar has 13 brown and black segments, which correspond to the 13 weeks of winter. The lighter brown a segment is, the milder that week of winter will be. The darker black a segment is, the colder and snowier the corresponding week will be.